Do you know that even though poison ivy or oak is sprayed with a weed control and looks dead, it can still be poisonous? This is because the poisonous oils are still present on the leaves! Even with long pants and sleeves and work gloves, many of us still contract poison ivy during these summer months. Two years ago, when I had poison ivy rash really bad from working in my yard, it was Grandma’s poison ivy & oak bar that came to my rescue! Grandma’s poison ivy bar is unique because it contains jewelweed, which is an ancient Indian herb that has been used as an antidote for poison ivy, oak & sumac for centuries. It works by soothing the skin and eliminating the urge to itch. If used immediately after exposure to poisonous plants, it can actually have preventative benefits! When used as a preventative, it is very important to wash with cold water so that your pores will close and reduce exposure to the oils when rinsed. If you already have a poison ivy rash, this bar works to relieve the itch every time you lather. If the itch is particularly bad, then after you wash, you will want to leave a little lather on your skin to dry. It will continue to work as it sits and dries on your skin. It is non-staining so you don’t have to worry about your clothing. 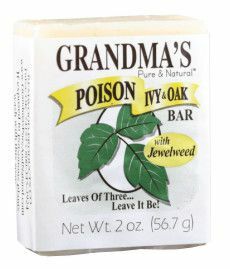 It is really important to stop the itch when you have a poisonous rash, and Grandma’s poison ivy & oak bar will help you with exactly that! As Grandma says, it is a must for every medicine cabinet. Grandma’s pure and natural soap company makes lots of unique products including their Don’t Bug Me Bar, which is a soap made from all natural ingredients including essential oils of eucalyptus, basil, and citronella to help keep the insects away.